CyberChimps, online at cyberchimps.com, is the destination for interactive WordPress themes for websites. CyberChimps has a wide range of user friendly tools that make building a website as easy as point and click. Not only is CyberChimps beautifully designed for PC's, but they are also available for phones and tablets. What makes CyberChimps stand out from the rest is their beautiful designs, excellent support, mobile-friendly, and is trusted by thousands. With over 5 million downloads and 11 million website launches, CyberChimps is as reliable as you can get. Want to give them a try? Check out RetailSteal.com for all the latest CyberChimp discounts, CyberChimp coupon codes, and CyberChimp promo codes. Shop at cyberchimps.com and save 30% on all products. Click here for code. Use this coupon code online at CyberChimps and enjoy a 10% discount. Get the starter plan at CyberChimps for only $19.99 for 1 year. Click here to save. Join the CyberChimp club at cyberchimp.com and join for as low as $97. Click here to shop. Save 15% on your Cyber Chimps purchase with this coupon code! 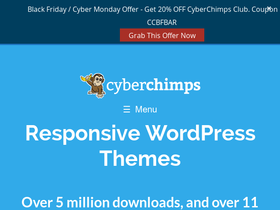 Save 25% on your CyberChimps purchase of any responsive WordPress themes, plugins or bundles with this coupon code! Save 40% on your CyberChimps Club purchase at CyberChimps with this coupon code!